A U.S. Mint 2014 Native American $1 Coin with missing edge lettering is positioned to score big in a GreatCollections sale ending Feb 8. Current bidding has the mint error at $6,450. Coin News Update: The dollar realized $12,934.90 with buyer’s fee. This piece, graded ANACS EU69, is distinct from standard annual issues. 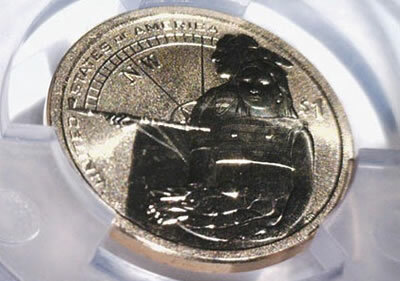 Coming from a 2014 American $1 Coin and Currency Set, it has a special enhanced uncirculated finish of which only 50,000 had been produced, and it’s the only known example with missing edge letterings. 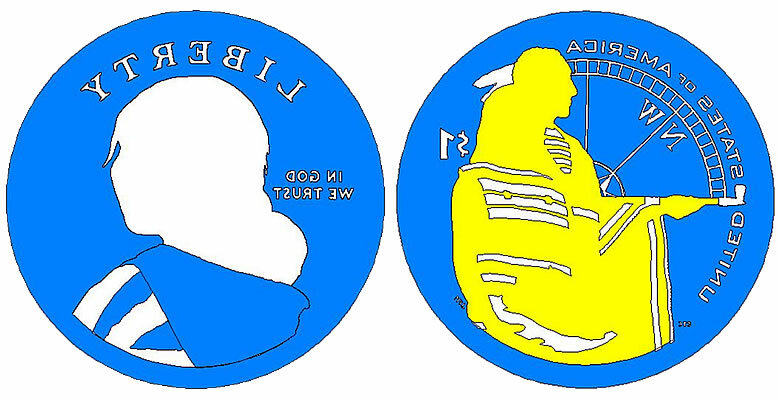 All US dollar coins have had edge-incused inscriptions of the year of issuance, "E PLURIBUS UNUM" and the mint mark. "IN GOD WE TRUST" also appeared on edges before it was moved to the obverse in 2009. Released by the United States Mint on Nov. 20, 2014 American $1 Coin and Currency Sets sold for $13.95. They include a 2014 Native American $1 Coin struck in Denver and an uncirculated Series 2013 $1 Federal Reserve note printed for the Federal Reserve Bank of Kansas City. Most collectors didn’t place them high on their want list. That changed quickly when they heard about the enhanced uncirculated coin that hadn’t been released elsewhere. The U.S. Mint didn’t actively promote the coin’s uniqueness which includes a base wire-brush finish topped by varying intensities of laser frosting. Except for a few hours here and there, 2014 American $1 Coin and Currency Sets have been listed as "out of stock" and resultantly off sale since Nov. 24. United States Mint sales figures have showed the maximum 50,000 claimed since Dec. 14. The Mint is yet to officially declare their sellout. The sets at this writing remain listed in the agency’s online store as "out of stock." My five sets are on their way and should be here, by the 11th. Maybe I hit the jack pot? I have no doubt, someone at the mint, made sure this coin received no edge lettering, and now we wait to find out if the mint will confiscate it as “counterfeit.” Remember what the mint did with the “extra” 1913 “V” nickles, erroneously minted by a mint employee. Actually they didn’t do anything with them 5 (or 6) of the nickels were eventually openly sold. Same thing with the no-S proofs. I don’t really see how the mint can confiscate what it sold to the public, unlike the ’33 double eagles which were never officially released. This may be an error, but it’s not a forgery. I received notification of my five sets arriving as well! What a pleasant surprise. I thought the backorder status was going to be like the Baseball Gold’s and just keep me thinking I was getting them for 6 darn months. Very excited to see the set. I’m just puzzled how no one knew these were special SBA’s. Happy collecting!!!! My 4 are in Sacramento and should be here Monday. Maybe I’ll have on of these blank edge coins, too! One can only hope! I wonder how many of the 50,000 been graded so far. Could be more ungraded error coins out there. Just got my three sets order on Dec. 4.
my 2 sets no error’s…. oh well still a nice set. Ditto here, Dale. No joy, but they’re still very attractive.